This increases the solar concentration levels at which cell efficiency peaks to up to 10,000 times ambient solar beam radiation, which is significantly higher than ever before. 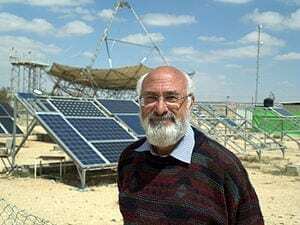 Researchers at Ben-Gurion University of the Negev (BGU) have developed a radically new design for a concentrator solar cell that, when irradiated from the side, generates solar conversion efficiencies that rival, and may eventually surpass, the most ultra-efficient photovoltaics. The new cell architecture developed at the David Ben-Gurion National Solar Research Center at BGU can exceed an ultra-efficient 40 percent conversion efficiency with intensities equal to 10,000 suns. The BGU invention also demonstrates the distinctly new possibility of exploiting common materials, such as silicon, previously deemed unsuitable under highly concentrated solar radiation. Tailoring the cells to edge (side) illumination reduces the cell internal resistance to negligible levels.